For the fourth year in a row, Samsung has debuted a large smartphone that comes with a stylus attachment and called it the Galaxy Note. 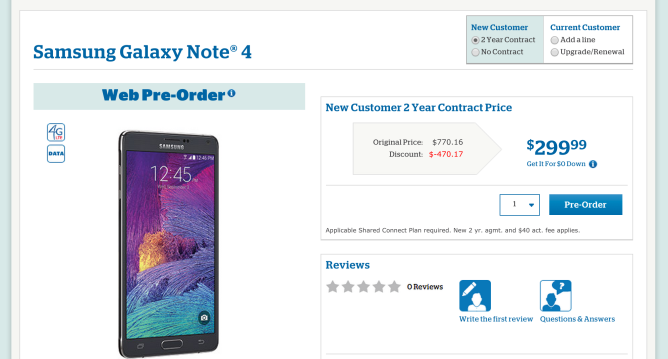 US Cellular customers looking to get their hands on 2014's release can do so online and in stores come October 17th. The more eager among you can head over to the carrier's site and place a pre-order right away. US Cellular's version of the Samsung Galaxy Note 4 goes for $299 with a two-year contract or a staggering $770.16 without. For that amount of money, you're getting 5.7-inch 2560x1440 Super AMOLED display, 3GB of RAM, 32GB of internal memory (supplemented by a microSD card slot), a 3220mAh battery, and a 16MP rear shooter. The hardware's pretty impressive, but you're going to have to rub a few pennies together to get your hands on one. Here's the full press release with more details. CHICAGO, IL--(Marketwired - October 13, 2014) - U.S. Cellular (NYSE: USM) has announced that the 4G LTE™ Samsung Galaxy Note® 4 will be available in stores and online on Friday, Oct. 17. The latest device in the flagship Galaxy Note series will come in charcoal black, and qualified customers will be able to add it to their Shared Connect plan and get it for $0 down using U.S. Cellular's equipment installment option. It is also currently available for pre-order at uscellular.com for $299 with a two-year contract. U.S. Cellular provides Galaxy Note 4 users with a best-in-class network that works wherever they want to go, from around the corner to across the country. By the end of the year, more than 93 percent of U.S. Cellular customers will be covered by a 4G LTE network. "The technology and array of features on the Samsung Galaxy Note 4 make it truly a unique device that can enhance your smartphone experience whether you are viewing stunning video or multi-tasking to efficiently get your work done," said Joe Settimi, vice president of marketing for U.S. Cellular. "We are focused on providing our customers the latest devices and a high quality network that gives them access to experiences that enhance their lives." The Galaxy Note 4's enhanced features enable users to get even more from their mobile device. Its 5.7-inch Quad HD Super AMOLEDTM display produces clear and vivid images with deep contrast and better viewing angles. Its advanced 16 megapixel rear-facing camera features an Optical Image Stabilizer that counter-balances camera shake and automatically extends exposure time in dark settings. The 3.7 megapixel front-facing camera offers a wider angle so users can take the best group shots with friends. With U.S. Cellular's $0 down equipment installment option (for qualified customers), customers pay tax on the Galaxy Note 4 at the point of sale, and then make 24 monthly payments that are conveniently added to their wireless bill. Customers can upgrade this device in as little as 12 months if they trade it in for an updated model, and they can also choose to pay off the full balance of their device anytime they want. Samsung, Galaxy Note, S Pen, Super AMOLED are all trademarks of Samsung Electronics Co., Ltd.